I had all my fabric on the shelf and ideas of sitting down to sew, but we decided before we got too settled to get the floors refinished. So my friend Maureen and I packed up all my fabric again! 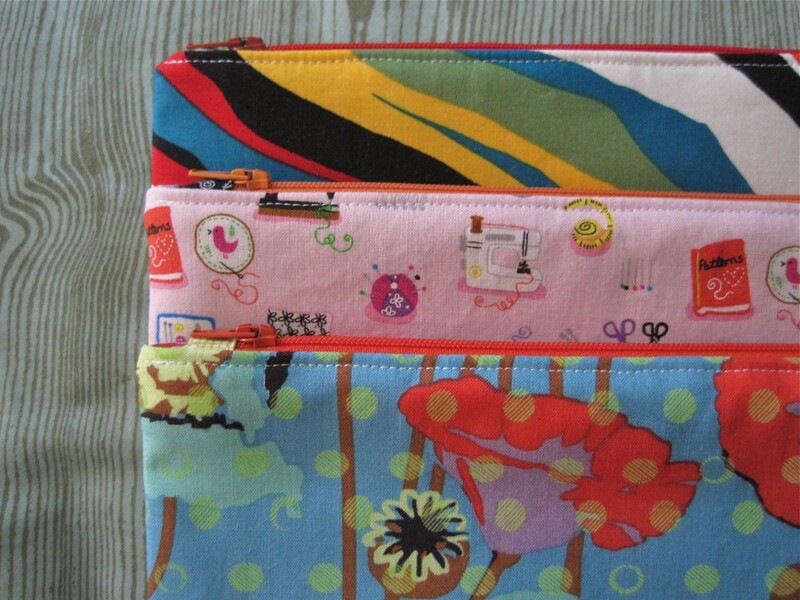 It didn’t stop me from some new stash additions from Quilt Sandwich Fabrics. I wasn’t even intending to create a coordinating set, but I somehow did! The Nordika is for a new whole cloth quilt and the Lizzy House kitties are to be napkins for our friend that is hosting us while we are displaced by floor work. 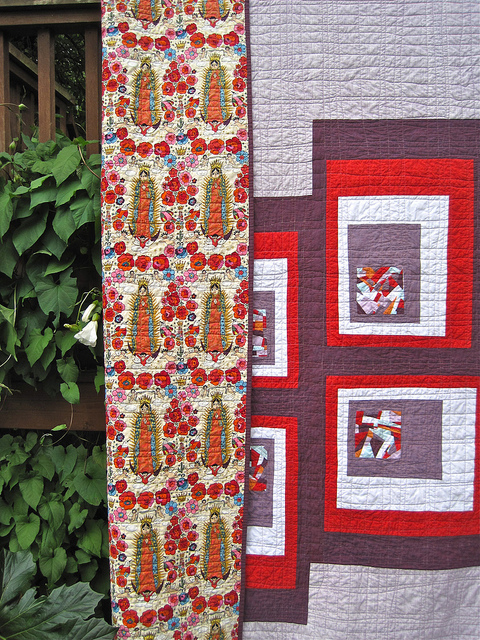 Quilt Sandwich is also hosting a Briar Rose Challenge. Details are here. Time to dig up my Sparkle Punch again! 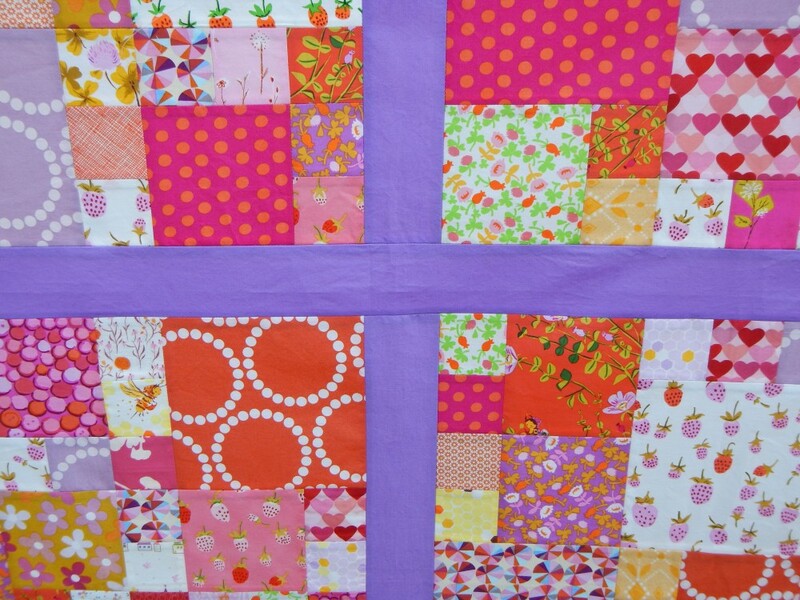 Or maybe quilt my Magic Number Berry Patch quilt. Jefe has requested that the new house have a neutral theme to the walls, but I’ve got to have some pop of color somewhere, so yesterday I took all the cans of paint left over from the old house and used them to start painting the insides of the closets. The Pure Periwinkle paint will make me smile every time. As I was painting I started to think about fabric colors and what are currently my favorite. This stack from Quilt Sandwich Fabrics sums it up. Mustard and crimson always go to the top of the list for me, and I’m not sure about the Alexander Henry except those mermaids are spot on (or maybe the hearts are:). Do you have go to colors, or do you trend? I’ve been trying to stay away from buying fabric, but how could I resist? Last Monday Maureen and I hopped the ferry to collect the Seattle Modern Quilt Guild’s Binary quilts Island Quilter had on display as their January exhibit and I was immediately onto the bolts of these kitties by Lizzy House. I have triangles or simple log cabins already in my head. 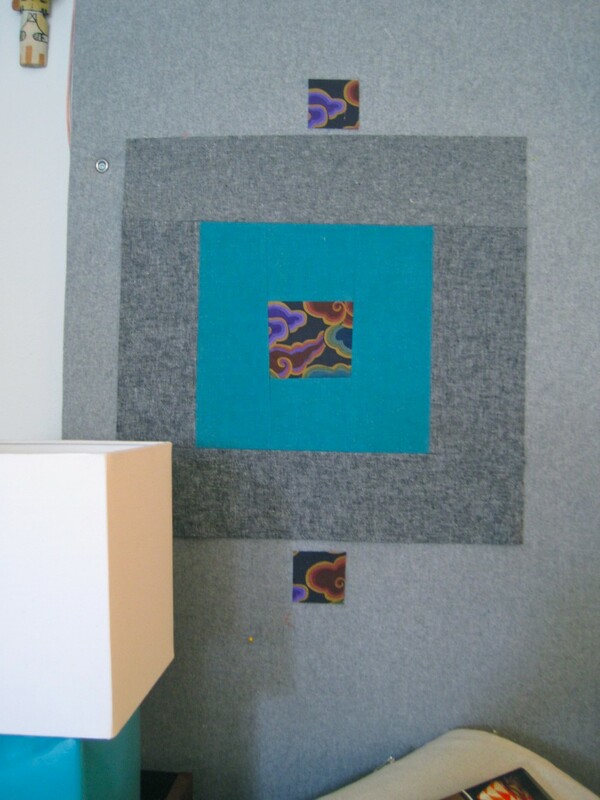 One of the first quilts I ever made was Denyse Schmidt’s What a Bunch of Squares. 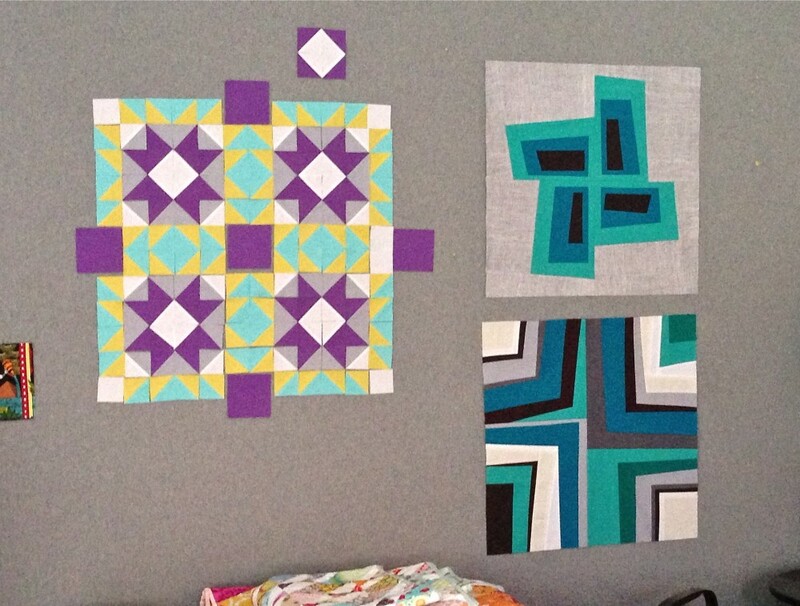 I was new to quilt making and was so excited that I created the templates and cut out most of the pieces for three of these quilts before constructing the first block. 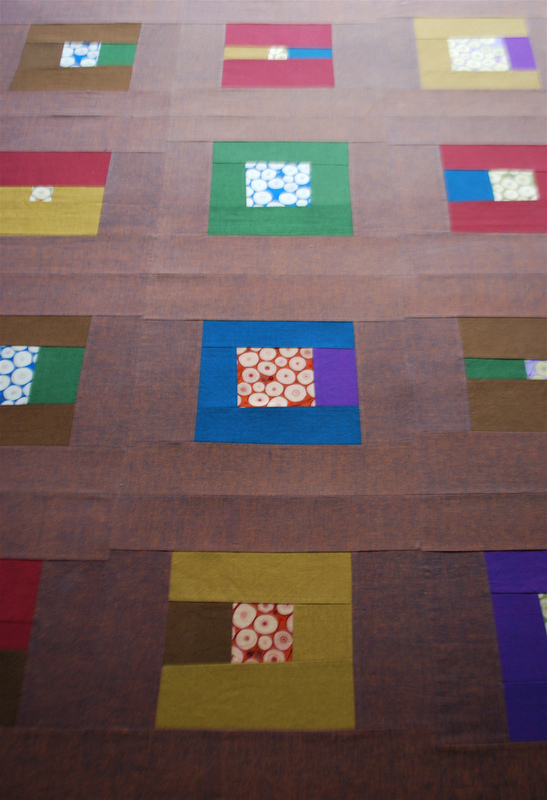 It became obvious after the construction of the first block that templates are a waste of time when piecing such a simple quilt. I’m good at wasting time without adding template construction to my life. 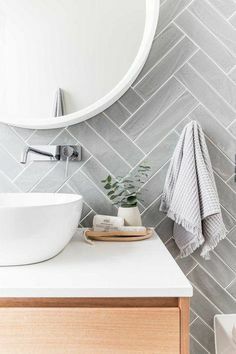 I hadn’t thought of these cut block sections until I ran into these Andover chambrays and Moda Cross Weaves at Drygoods Design. Now those old cut pieces are taking block shape with some new woven fabric additions. It was difficult to capture the texture in a photograph on a rainy Seattle day, but blocked with the Essex linen it certainly isn’t lacking. I also am hoping to make it to some Halloween sewing in a few days with this Martinique Silky Woven Shell. 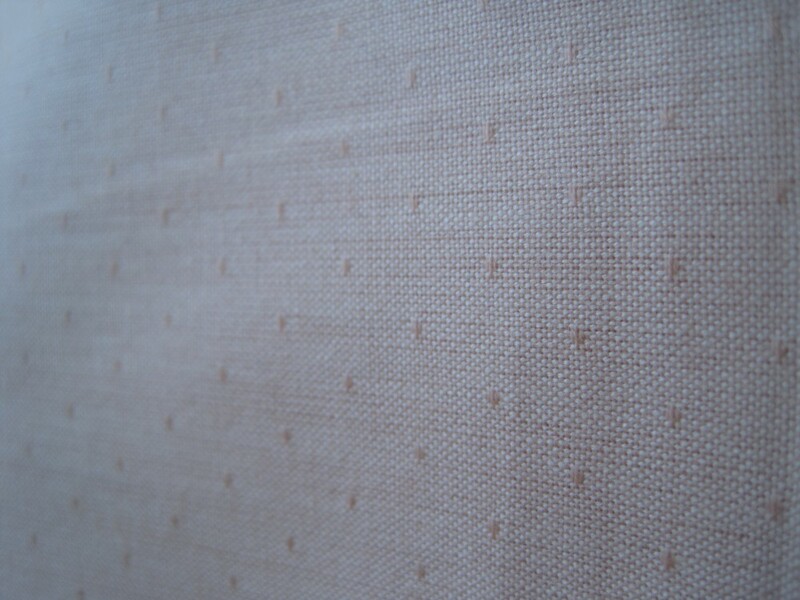 There is the smallest pin dot on this fabric. Everything about it is soft. The drape, the pink color and the dot. Love those stitching witches! 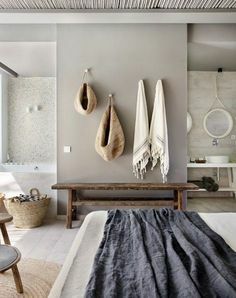 Everything’s washed and waiting its turn. The countdown to the school year ended today and the Labor Day weekend weather in Seattle truly could not have gotten any better. I love autumn for its closure on a loose routine and boots, I like boots. But it also makes me want to sew and look at all the new colors and fabrics that come with a new season. It also makes me walk into fabric stores without a child. West Seattle Fabric Company had Denyse Schmidt’s new line Florence and a whole rainbow of Michail Miller solids, my new solid favorite. I think Denyse got the right mix of retro involved in this line, I can see it blending with a lot of other prints and solids. I’m also trying to get over my fear of brown, so this Michael Miller is my gateway brown. 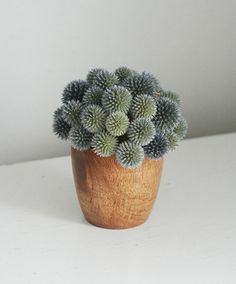 I’m especially in love with the dot. They had a bunch more of the line I was tempted by, but my stack should do it. You can view it here. I’ve already made my dream pile. Now I just have to get to the load of other projects before starting another. I’m sure Jefe is wondering why I haven’t made him anything patchwork for the Vanagon yet. Happy sewing friends, for me it is officially autumn! P.S. a little bird told me that there are open studios and classes galore for fall, so go check them out! Do you ever buy fabric with nothing in mind? Quilt Sandwich makes it hard for me to resist with their stock of Alexander Henry. Even though I need ZERO fabric, they make me feel like I’m running out. I’ve collected a pile of the previous Ghastlies lines and ever since market have been waiting for Ghastlie Holiday to come out. 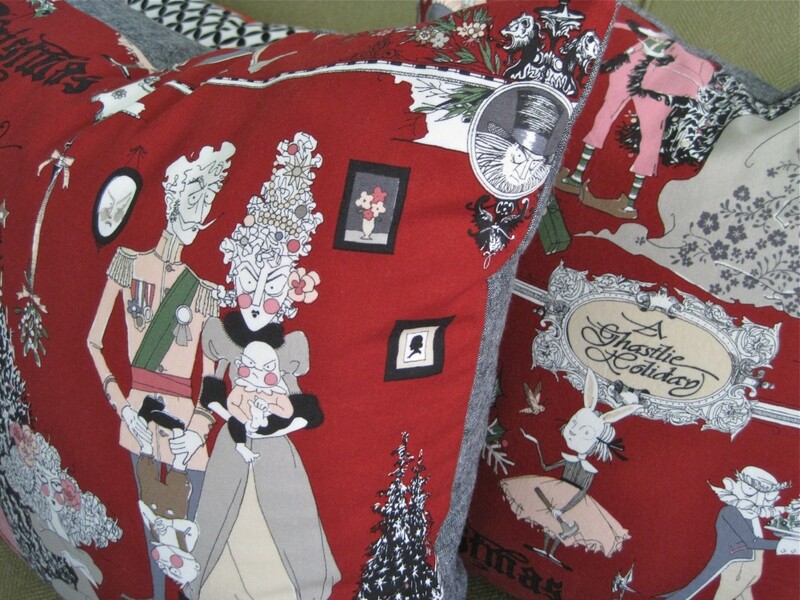 Pillows have already been made as samples for my invisible zipper class and the sage color will go onto my my holiday couch to replace some Halloween Ghastlies pillows. Maybe a holiday A-Line skirt? This jeweled web will be the backside of napkins as soon as I purchase the coordinate with the little costumed kids holding hands in a row. The detail in Aoi Has Two Sisters is what you expect from Alexander Henry. Each dress is made of a fabulous print itself. Even the flowers feature different prints. I’ve already made some napkins for a friend and myself. 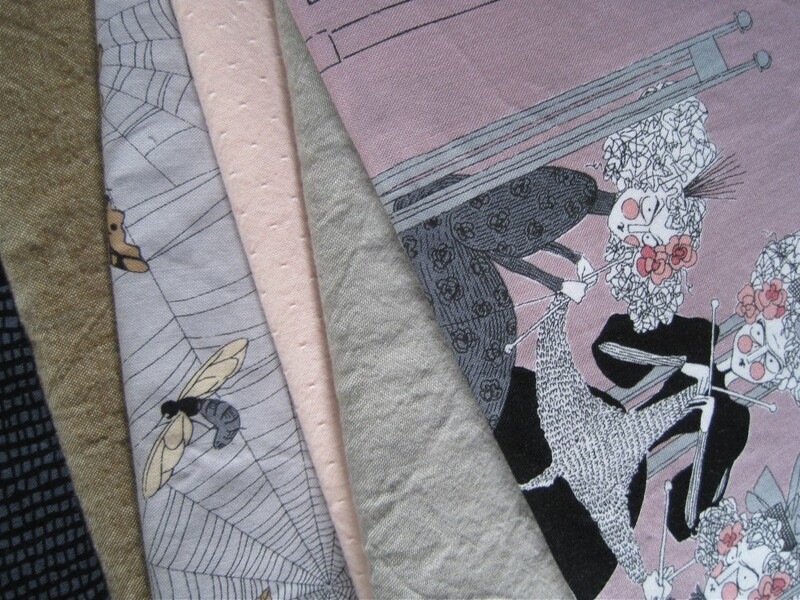 Napkins and pillows apparently give me a good excuse to buy fabric. Happy Sunday! Now go sew. I always anticipate Erin McMorris’s new lines. Her first line Park Slope still lingers in some of my projects and in my mind her way with flowers is her signature on the fabric world. When ordering some basics the other day from Quilt Sandwich’s stocked sale section I asked Becca if they had the Astrid line in yet and was so pleased to hear it had just arrived. Astrid, steps Erin’s flowers out from their usual whimsical theme to the modern. 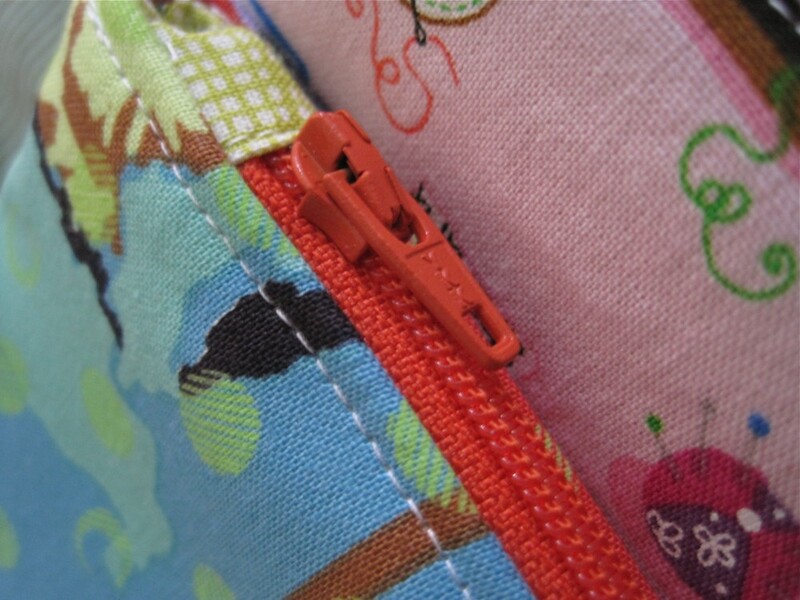 I also tend to be drawn to the same color palette that Erin’s fabric lines have and Astrid has done it again. 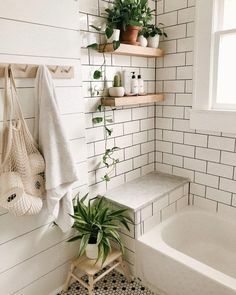 I want every color of the whole line, but stopped with the basics. This line works so well together with a solid or two. 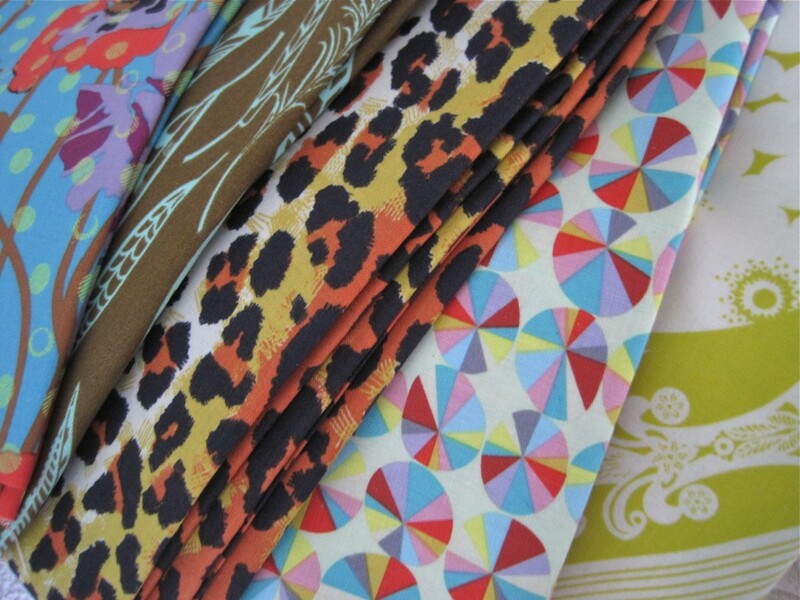 Generally most fabric lines most fabric lines don’t mingle together without a flat effect, but Erin’s got you covered on all the color values you need for a successful project whether it be patchwork or apparel. I had a little left over modern crazy piecing so I went to work making an Ipad case and Astrid worked itself in perfectly. I’d love to see the hourglass print reproduced on a mini scale and a million colors. Off to teach. Have a great Sunday! I’ve long been a fan of a good cross-hatch. First Alexander Henry came out with Heath and I’ve definitely thrown my fair share of it into projects here and there. 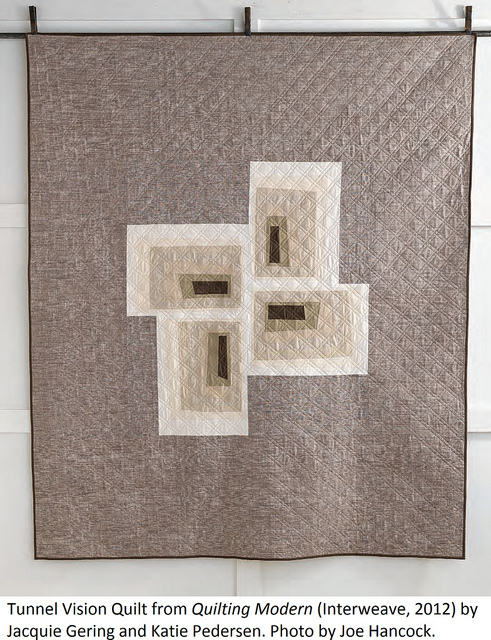 Then Carolyn Friedlander came out with her wonderful cross-hatch version and now Timeless Treasures has a tone on tone version in every color. 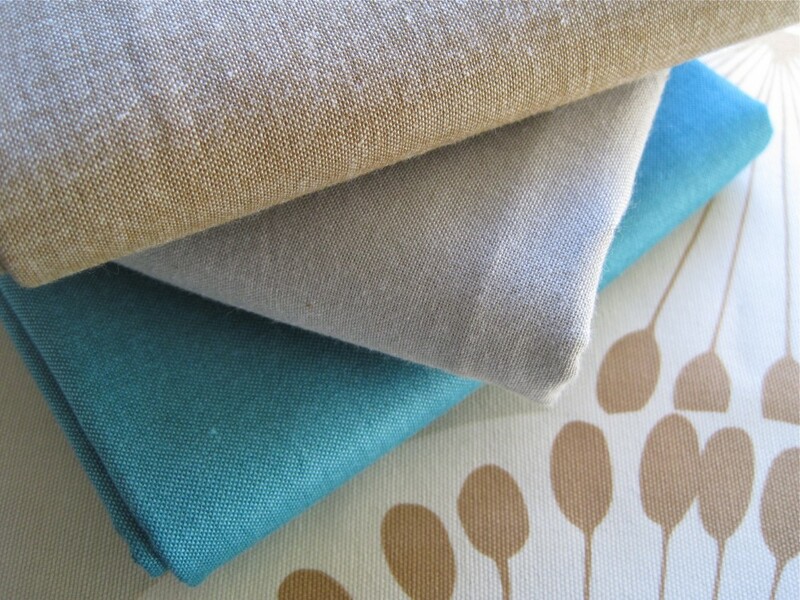 The West Seattle Fabric Company has several colors of the collection. I couldn’t resist these jewel tones. I’m trying to move onto some navy in my work too, though I’m having some difficulty escaping my purple obsession lately and this was good fuel. I also picked up more of Michael Miller’s cotton couture in teal. This solid is fabulously soft and just seemed to polish off the new additions. 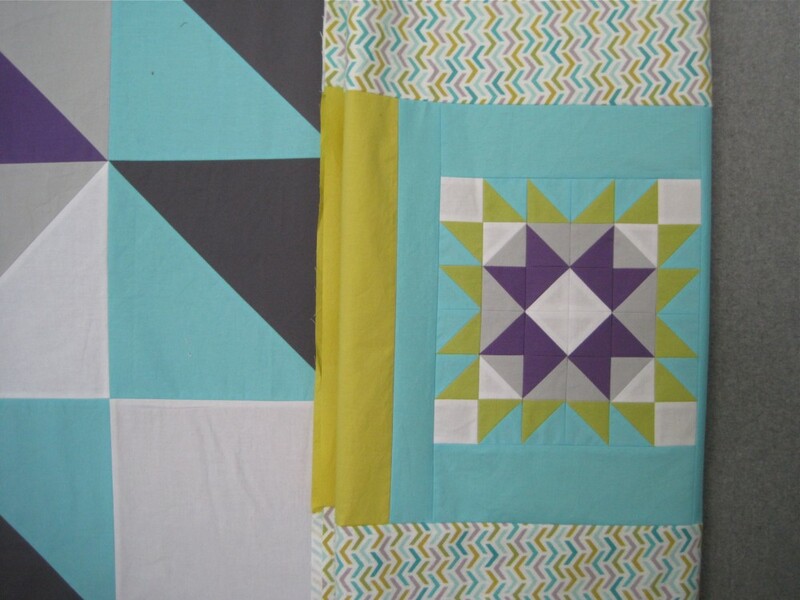 My thought with these crosshatch prints and solids are some mini versions of the Tunnel Vision quilt from the book. I’ve made a mini pillow version with Heath recently and am going to branch out with the other colors offered in this Timeless Treasures collection. In fact, I’m off to quilt those tops now and make them into pillows with invisible zips. Class coming soon. We’re in heatwave mode in Seattle, so it’s a good day to sew or maybe visit a nicely air-conditioned fabric shop! Happy first day of July! Look what arrived from Quilt Sandwich?! 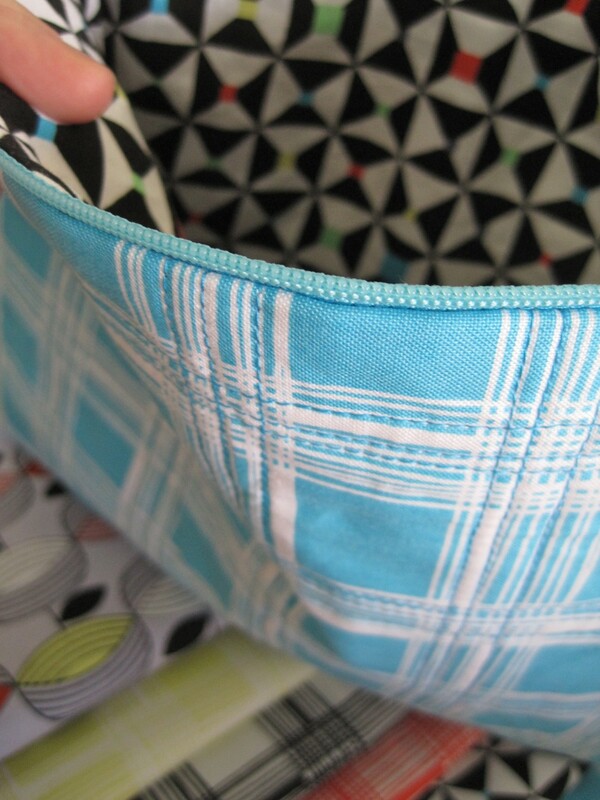 I don’t know what it is about Anna Maria Horner fabrics, but each line takes a bit to grow on me. Then I think maybe I’ve waited too long and it’s all gone. With a Zip Pouch class coming up I thought I would put my favorite of the pile (the poppies) to use immediately for a sample. I didn’t even wash it, gasp…so unlike me. Such a great poppy red. 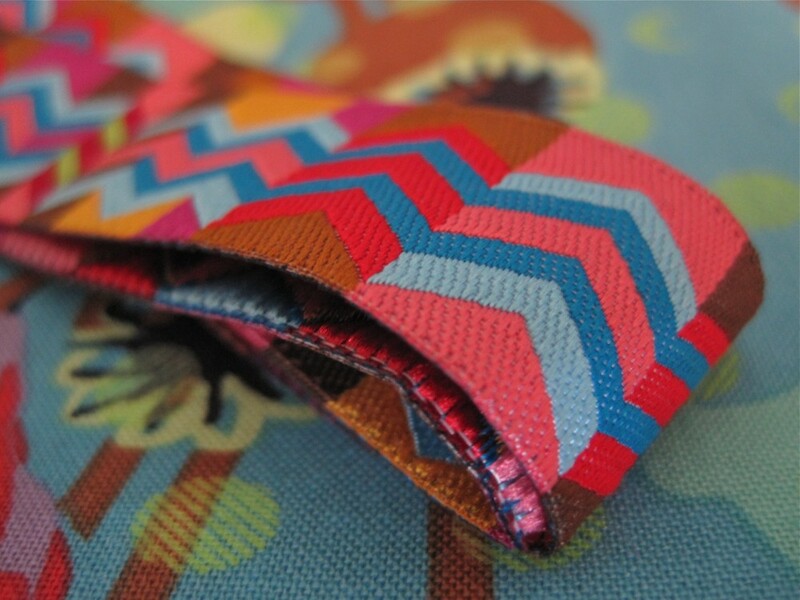 Oh, and look what’s coming soon to Quilt Sandwich? I think there are key fobs in my future. I’ve only had all the hardware for a year. What can I say, I like to mull things over for awhile. 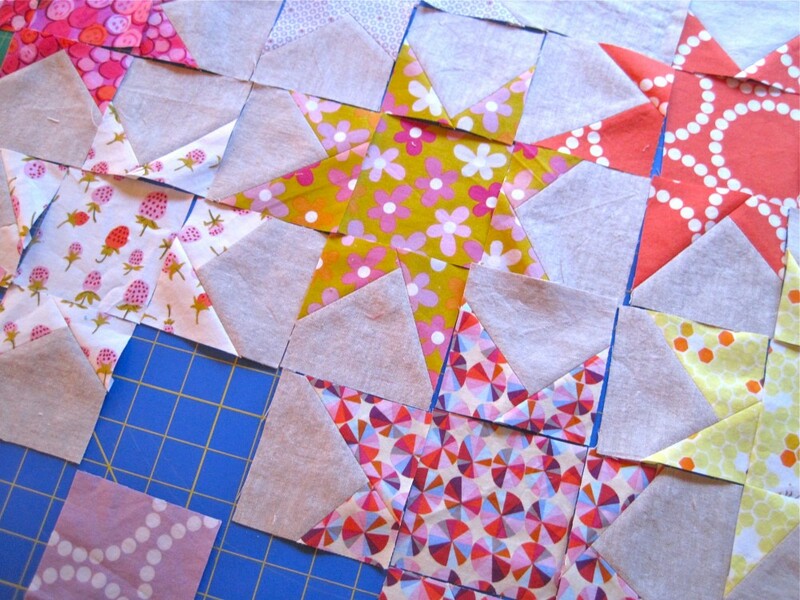 I’ve got this Barn Quilt Block idea that I’ve been playing with. It started with pulling out my Prisma colors that I still have from high school. 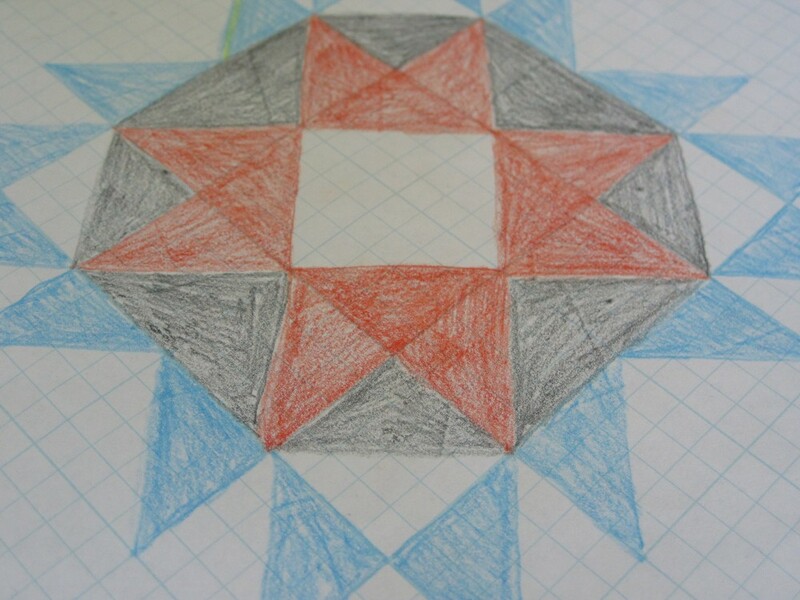 Although I’m not much for drawing out quilt design, I still use them here and there when it comes to a traditional square block. 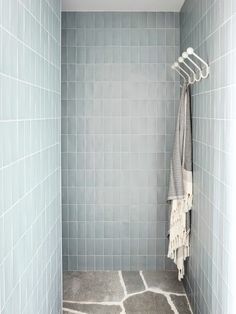 My original thought was robin egg blue, white, grey and orange. One of my favorite color ways. Drygoods Design carries the Michael Miller Cotton Couture which I’m drawn to more and more. The hand is soft and the weight perfect for quilting. My color way changed when Keli and I picked this Michael Miller Les Amis Ripples flannel up. Does the color way look familiar? I put them all together with some purple. It’s interesting how color and value are relative, the purple makes the grey in the flannel appear to have a purple tint. I’m looking forward to working with more of these solids. No one does Mexican folklore fabric like Alexander Henry. 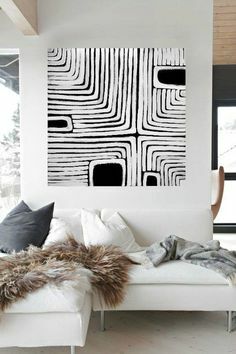 I’d like to know the story behind what draws them to this genre of art? 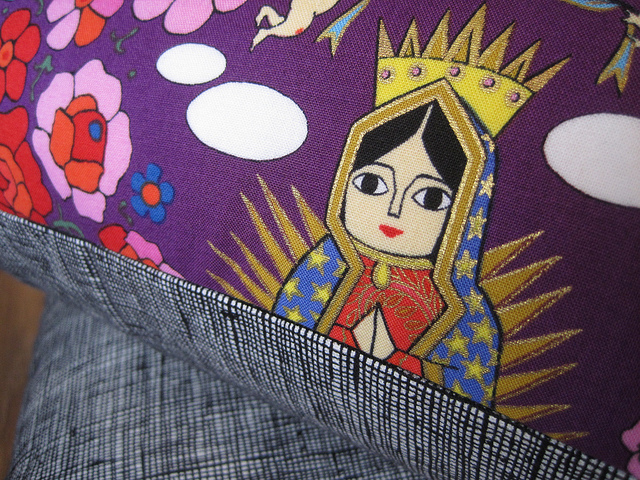 I picked up more of the La Virgencita line when I saw it at Island Quilter. 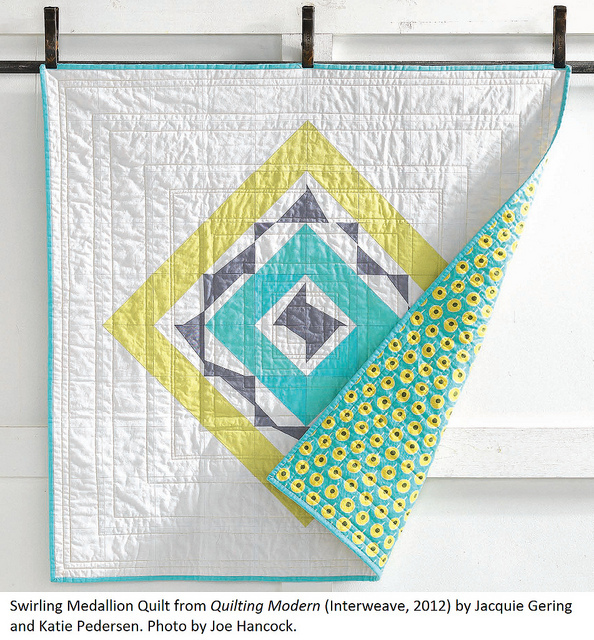 Island Quilter carries two color ways and they ship! I’ve now made an apron and a set of pillows for Christmas time with the purple color way. The metallic bling adds some nice depth. The tea colored background made it into the back of my Seam Ripper IPA quilt. I really wanted to showcase this fabulous print and did not piece a thing into the backing. I bought some more to make my sister-in-law pillows for her birthday. Raised in Catholic schools she has collected virgin statues for years. 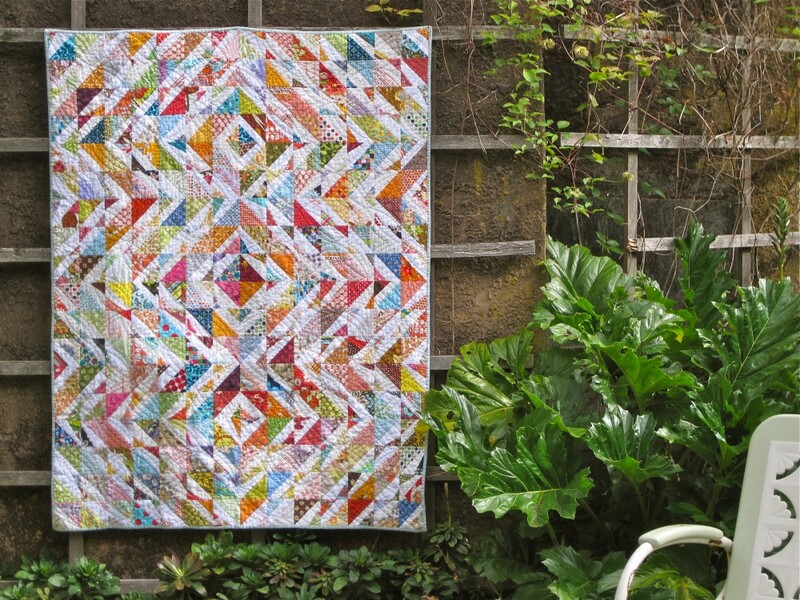 My new favorite this year that Island Quilter has is Lupe. 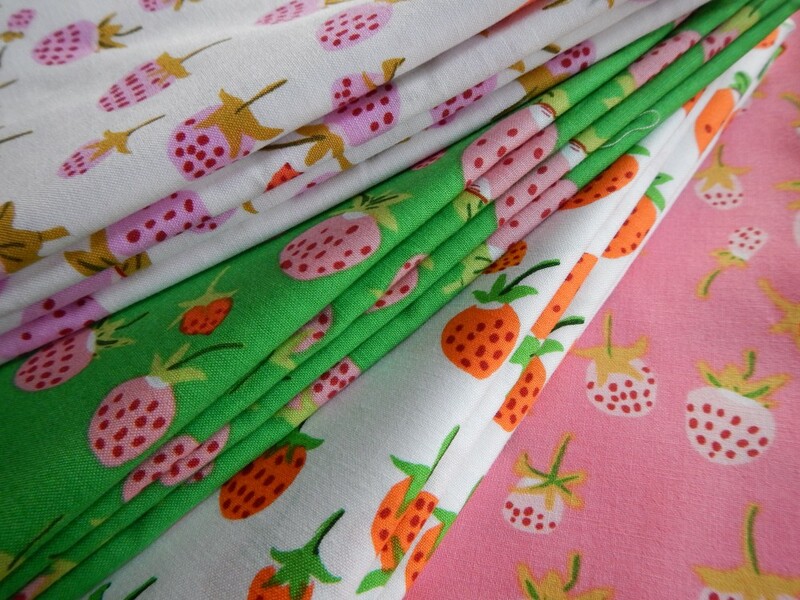 It’s a delicate print that will make its way into napkins or little girl projects.